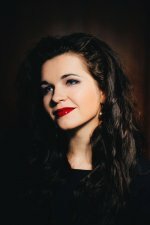 Since 2014 Marēna has been a postgraduate student of professor Anna Samuil at the Berlin Hanns Eisler Academy of Music. Merlēna began her professional musical career at the Jāzeps Mediņš Riga Music School in the class of Krišjānis Norvelis. She received the Bachelor’s degree from Tallinn Academy of Music and Theatre where her vocal teacher was Nadia Kurem, Head of Vocal Department. During her studies she made her debut in the Tallinn National Opera Theatre in the role of Caroline in Cimarosa’s The Secret Marriage directed by Giorgio Bongiovanni and conducted by Risto Joost. Soon after she had the debut in the operetta genre in Latvia, singing in Dostal’s Clivia in the role of border guard sergeant Viola Dante, directed by Jānis Kaijaks and conducted by Guntars Bernāts. In 2014 she sang the role of Barbarine in Mozart’s The Marriage of Figaro directed by Marcelo Lombardero and conducted by Valdis Butāns. Marlēna has been a laureate of a number of international competitions. She won the 1st prize in Masterworks Vocalists’ Competition in USA (2015), 2nd prize in Oksana Petrenko Competition in Ukraine (2011). Marlēna has collaborated with conductors Mārtiņš Ozoliņš and Andris Veismanis. She performs on regular basis in Latvia, Germany and Estonia and has also given recitals in Sweden and Indiana (USA).